Ybor, a small sub city, more like a district within Tampa, has seen dozens of revivals over the past century. The initial renaissance, starting in 1902, gave it tenure as the cigar manufacturing capital of the world. Though, trumping its unique industry, were the immigrants who made up the community. A melting pot of Cubans, Spaniards, Italians, Afro-Cubans and Germans. Ybor City, a mile by mile square, a grid of about a dozen streets, became the only integrated city in the US at the time. Not only was it integrated through race, women prospered within its equality. Some of its women, becoming, in cases, much more skilled in cigar making than men while making comparable incomes. The community thrived, so much so that, according to Gary Mormino, cigar workers could make pay equivalent to that of a skilled carpenter in Chicago. Ybor was also home to Mutual Aid Societies. These “Social Clubs” served as early socialized health care. A small tax (about 5% of income) was taken out of every worker’s salary. The tax provided not only health care, but after hours recreation within the clubs. Spread throughout Ybor, one massive club provided care to each major immigrant population. All of them, still standing today as monuments to Ybor’s golden age. As Florida Crackers built their wood frame, tin roofed, single story homes on the outskirts of Tampa, Ybor moved upwards. Within the heart of Seventh Avenue, masons built rows of two story, red brick architecture influenced by their mother lands. Walking into Ybor was (and for the most part still is) like walking onto the streets of Havana: delicate arch ways, wrought iron-worked facades, maze-like alleyways (something that doesn’t exist anywhere else in Tampa), and rows of outer lying shotgun houses (narrow and long, tight quartered homes inhabited by the cigar workers). Hundreds of cigar shops existed throughout the city. Some of them, massive, four story buildings extending between blocks. And underneath the city, a now sealed up mysterious underground: tunnels running from building to building, masking the illegal running of spirits during prohibition. This is what we see, once a week, pedalling down Seventh Avenue to our curb spot. The curb is nothing special: a flat, low, winding sidewalk sandwiched between a bank and an old cigar shop turned water hole. We chose this spot not because of its uniqueness, but to have an excuse to be surrounded by Ybor’s looming buildings: its history. And with it, its unique aesthetic, somehow continuously inspiring our simple sessions, smack in the middle of Tampa’s urban, culturally neutered sprawl. We chose it too, because of the chickens. 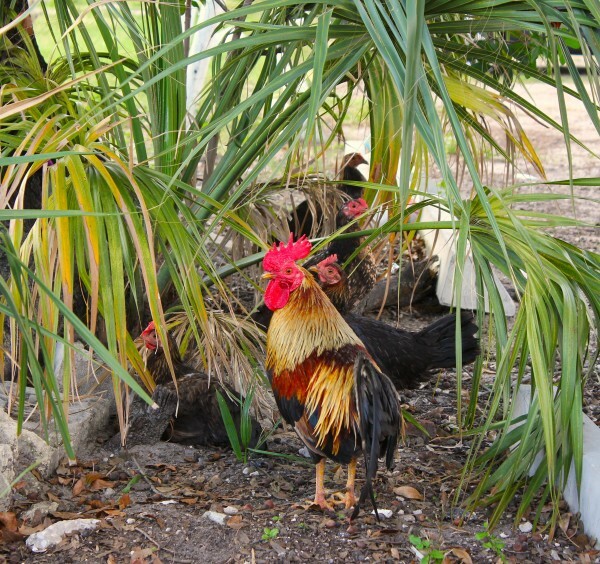 In the 1890’s, when Ybor was first plowed for development, fowl were a residential mainstay. Now, hundreds of generations later, the ancestors of the first immigrant’s birds strut like gangs through the city. They lurk within Ybor’s limits, travelling in groups sometimes numbering up to twenty: a posse of hens, their diminutive chicks following. Brindled within, as if sentries to the flock, giant, radiant roosters with feathers in bright red, white, and gold. The birds make a consistent and terrible racket. Sometimes you can hear their call on the outskirts of town. 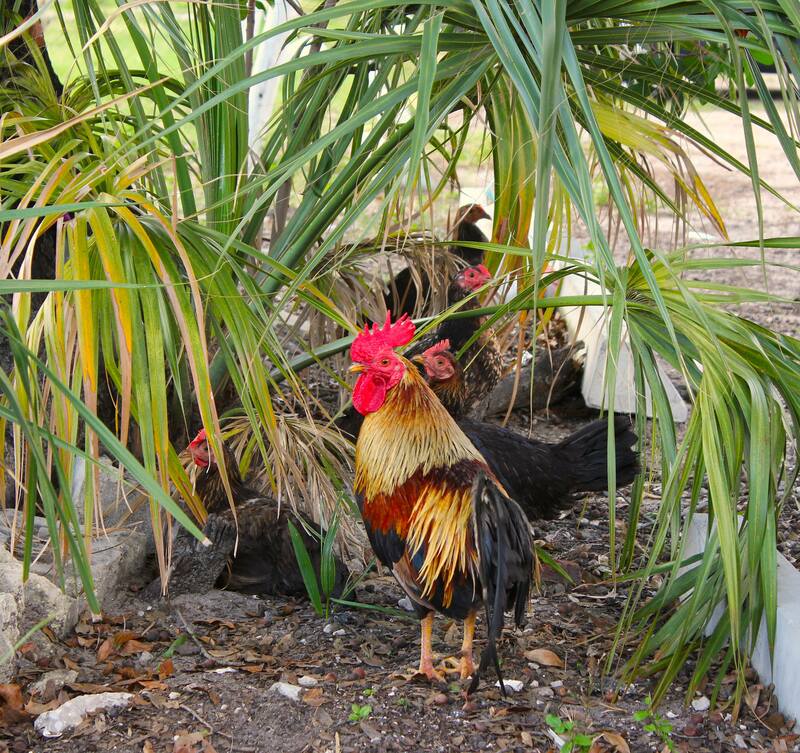 They peck freely in residents yards, build nests on the many historic structures, and are not afraid to hold up traffic as they casually walk, in masse, across Ybor’s streets. And other than the potential terrorizing by neighborhood cats and dogs, the chickens, for the most part, are protected. Ybor’s status as a historic landmark comes with a caveat: It’s also a bird sanctuary.